The vegetation here is different from the usual woodlands; it consists of high and dense forest. Udzungwa Mountains has only recently gained its status as a National Park. Swathed in a unique and fascinating rain forest, the mountains have been untouched for thousands of years due to the taboos of traditional beliefs. Still rarely visited, Udzungwa is a must for those looking for this the true "country of contrasts". 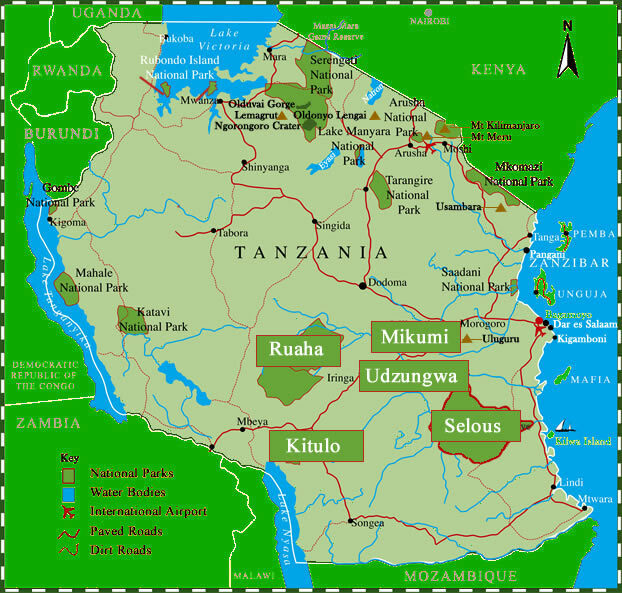 The Udzungwa forest is part of the Eastern Arc, which extends from the Southern Highlands through the Uluguru and Usambara mountains nothwards to Pare. The forests in the Eastern Arc are known for their very high biodiversity. The Usambara violet has one of its most south westerly occurrences in Udzungwa. Three monkeys, Sanje crested mangabey, the Matundu galago and the Iringa red colobus, are found only in Udzungwa. Visitors in the park are likely to see at least the red colobus.